Fix: Fixed a bug that prevented ExactDestination from working correctly. Fix: Stopped trying to handle portals in non-managed worlds. Fix: Fixed a few Bukkit compatibility issues. Change: Removed AllPay and now using "MVEconomist" which currently delegates all economy stuff to Vault. You will need to update Multiverse-Portals if you are using it. Fix: Non-default worlds will now no longer initially load their spawn chunks if keepSpawnInMemory is false. Fix: currency (entryfee.amount) property now able to be set properly. Fix: Some permissions issues should be fixed thanks to switch to CommandHandler 8. Fix: Possibly fixed the pvp/difficulty property issue! Fix: Now correctly handles portalForm for end and nether portals! Change: Once again managing teleportation into MV worlds from non-MV worlds. New: Added framework for custom teleporters. Fix: Maps can now be made from non-default worlds. Fix: Should fix issue where gamemode/flight change on /reload of server due to permission issues. Fix: Don't try to set search radius when portal travel agent is null. Fix: Now actually allows world names with periods. Change: Now building against Vault 1.2.20 which is hosted on our own repo now. Change: Changed the default portal search radius back to match vanilla's 128 instead of 16. Change: Using an invalid generator will clearly state that it is not Multiverse's fault. Change: Removing deprecated getMVConfiguration() method because I suspect it could be related to some issues. Change: Now using apache commons for file operations. Change: Made creating amplified worlds a little more intuitive. New: Added world property 'allowFlight' to disable flying per world. Does not have an override permission yet. 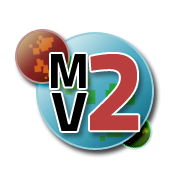 New: Added "/mv gamerule" and "/mv gamerules" for setting and listing game rules per world. New: Added bats to animals for the time being. New: Added config option to change the format for prefixchat. New: Added World Load/Unload Event listeners to support Forge. Fix: World names can now have dots in them. Fix: Squashed NPE when teleporting to worlds not managed by Multiverse. Fix: Stop checking economy stuff if a world has no cost. Fix: Stopped loading deleted worlds. Fix: Improved command error messages. Fix: Now yells at you if you specify a bad generator plugin name. Fix: NPCs should not show up in '/mv who'. Fix: Now explains why you cannot create a duplicate world. Fix: Now spawns people at their better more effectively. Fix: Golems can now be blocked. Change: Setting debug mode now saves to the config. Change: Version command now outputs more useful world info. Change: Multiverse now uses its own portal search radius which defaults to 16, overriding the bukkit default of 128. This will cause Nether portals to link to each other MUCH more accurately. It is also configurable. New: Added '/mv clone' command to clone a multiverse world. New: Improved support for LARGEBIOME maps. New: Added 'multiverse.core.list.anchor' permission for allowing listing of all anchors. New: '/mv who' now shows online players out of max players count. New: Added world property 'animalrate' and 'monsterrate' for settings how many ticks between attempting to spawn animals and monsters with a default of -1 indicating the use of bukkit.yml settings. New: Added 'playerlimit' world property to limit the number of players per world. New: Added '/mv silent' to allow you to disable many of our startup messages. Many other bug fixes and minor changes that didn't make it on this list. YOU MAY NEED TO USE DEVELOPMENTAL BUILDS OF OTHER MULTIVERSE PLUGINS IN ORDER TO USE THIS VERSION. This version is NOT and Awesome Build and MAY contain bugs. Please report any bugs found here We are trying to prepare for an Awesome Build and need your help! This build is generally considered stable but you have been warned!